This is just a reminder that today, Wednesday June 28th is a CSA share pick-up. Your share will be ready for you to pick up at your chosen pick-up location between 4-7 pm. We are excited about this week's harvest. The first official week of summer on the farm has brought with it the rewards we are reaping from the seeds sown during spring-time, oh the metaphors this incredible place inspires. When the new crew of fresh faces arrived to farm for the season, the first field task was to lay out dried fava beans in what looked like endless rows and mound them under the cool spring soil as we bid them the best of luck. Now June, the fava beans make one of the best hiding spots on the farm as they are shoulder high and as impressive as ever. The fava branches are abundant with large green pods so plump with the tender beans look like they may very well burst open! The other early summer legumes, english peas and snow peas are just as noteworthy and sweet right now. While the life on top of the soil is shooting upwards in green displays of magnificence, it was the treasures forming under the soil that capitivated us during harvest this week. 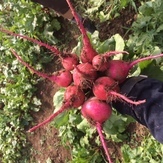 Red beets slid effortlessly out of the soil and taunted the chioggia and golden beets to catch up in size so that they too can be admired and ultimately enjoyed on your plate. Shallots were not to be forgotten either as their sweet onion smell wafted over the field during harvest. Neighboring the onions, is the garlic where the final few crisp snaps could be heard as the crew broke off the last remaining garlic scapes. The garlic bulbs will now wait quietly underground until we are ready to harvest and dry them to share during our fall and winter bounty. Across the field we have made the final cut of our "bigger than a head" romaine lettuce, clearing the way for our planting of fall root crops. 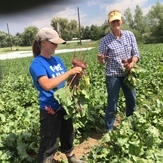 The field is overflowing now as we continue to tend to the crops that will feed us this summer and anticipate the growth of the seeds that will fill our tables with fall and winter produce. While our field plan suggests we are swiftly moving towards the next season, our hands are keeping us grounded in the present as we dig into the beautiful produce that summer has to offer. Combine vinegar, mustard, shallot, 1/2 teaspoon coarse salt, and 1/4 teaspoon pepper in a large bowl and whisk to combine. Whisking constantly, add oil in a slow, steady stream until oil is incorporated and mixture is emulsified. Pour over chopped kale or romaine lettuce. Sprinkle with sharp cheese and add dried fruit or extra veggies. Serve immediately. Remove from the oven and immediately toss with the vinegar and orange juice. Sprinkle with salt and pepper and serve warm. Coffee share - this week - please pick up! Bread share - production snafu - pick up next week! Wine & cheese - this week - please pick up! This week's perfect summer Rose is brought to you by, Erich Sattler, emblematic of the new generation of Austrian vintners: a wine-school grad and the 4th generation in the family to take over his family’s estate, in 1999. “We make wine as my grandfather did,” he says, “only with better machines.” Located in and around the village of Tadten, Sattler’s vineyards are on the east side of Lake Neusiedl, which moderates the warm air from the easterly Pannonian plain’s continental influence. Sattler’s st. laurent and zweigelt vines, some of which are 40+ years old, are well suited to gravel soils for the production of wines with ‘ripe, soft tannin,’ Erich’s primary goal. The wine pairing for this share is a delicious Pawlet cow's milke cheese. Made from raw Jersey cow milk, Pawlet is an Italian-style toma, aged four to six months. It is named after the town of Pawlet, VT, which is famous for its slate, syrup, and timber. With a creamy, buttery paste, Pawlet has a distinctive herbal flavour with a funky stink. It is a very versatile, perfect-for-melting cheese that goes perfect with grilled sandwiches and burgers. Opportunity is missed by most people becuase it is dressed in overalls and looks like work.